Want to make it easier for your users to find relevant solutions related to your product or service? You can use the Opinion Stage quiz maker to help them discover a solution that works for them, based on their needs and preferences. For example, the solution finder below could be used by a health food store that wants to help users find the right juicer to buy. The quiz prompts the users to enter their preferences and then shows them a relevant result based on their responses. You can use Opinion Stage to accurately measure the performance of your solution finder. 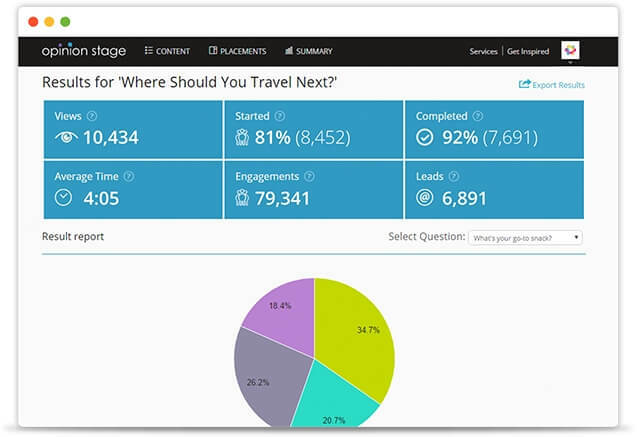 Some key metrics you can track include the the engagement rate, time spent on the tool and drop-off points. You can also export all the responses information for advanced analysis. At the end of the solution finder quiz, you can configure a customized and personalized result page that will help you sell your service or product. You can also redirect the quiz participant to a different service/product page based on their answers. 1) You can gather user contact information as they fill out your quiz, and then use that information to follow up with them. 2) You can add tracking pixels to your content to attract different users back to your landing pages, depending on the answers they provided in the quiz.